From producer Duncan Kenworthy and writer Anthony Minghella, the third episode of Jim Henson’s The StoryTeller, titled A Story Short, aired on NBC on January 22, 1988. 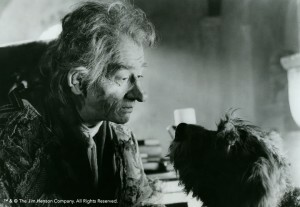 Adapted from an early Celtic folktale, A Story Short is unique to The StoryTeller series in that it is the only episode whose story features the Storyteller himself, played by John Hurt. He tells the tale of his time as a beggar, when he convinces the cook at the kingdom’s castle to let him make a “simple stone soup.” When the cook realizes he’s been had, the Storyteller is brought to the king, who decides that his “punishment” will be to tell a new story every night for a year in return for a gold coin – and will face being boiled in oil if he fails. On the 364th day, after a wonderful year any artist would be pleased with, he finds himself a story short. 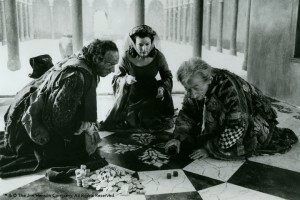 He comes across a beggar (John Kavanagh) who seems to bring him nothing but bad luck and the worst day of his life. Though the beggar convinces him to gamble away seemingly everything, turns him into a hare (performed by Brian Henson and Alistair Fullarton) and then a flea, he actually gives the Storyteller more than he realizes – a tale to tell the king that night. “…You begin to think the thing is alive!” – John Hurt on rehearsing with his puppet dog (performed by Brian Henson), 1987. 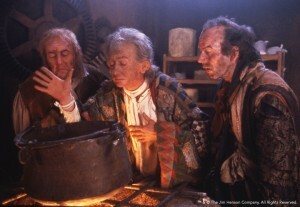 The Storyteller makes stone soup, with the cook (Bryan Pringle) and beggar watching, 1987. The Storyteller gambles for his wife (Brenda Blethyn), 1987. This entry was posted in 01-January '88, 1988, Storyteller and tagged Alistair Fullarton, Anthony Minghella, Brian Henson, Duncan Kenworthy, John Hurt, NBC. Bookmark the permalink.